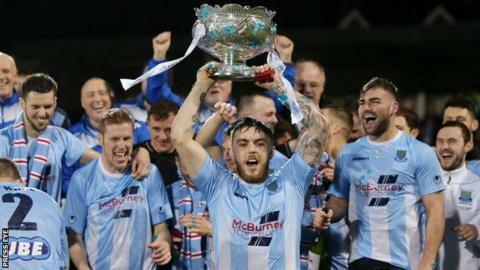 Tuesday's scheduled League Cup semi-final between Ballymena United and Cliftonville has been postponed because of a frozen pitch at the Showgrounds. A Northern Ireland Football League statement said the decision had been taken "in light of the adverse weather conditions and in the interests of supporter and player safety". The last four game will now be played on Tuesday 16 January, 2018. A decision on the Dungannon Swifts v Crusaders tie will be taken on Tuesday. The match at Stangmore Park is also doubtful because of the freezing weather conditions. "There will be a further review on Tuesday morning of Stangmore Park and notice will be provided of any decisions or subsequent pitch inspections required," read the update from NIFL. The pitch at Ballymena Showgrounds was still covered with snow and ice on Monday and with further freezing temperatures forecast for Monday night, the decision was taken to call off the game. Walkways and terracing around the ground are also in poor condition. Four of Saturday's six scheduled Irish Premiership games fell victim of the cold snap.